I called the private medical cover people and they won’t cover further tests/appointments until or unless I get a definite diagnosis unrelated to endometriosis. Or unless this whole mess drags on into October when the 2 year moratorium on pre-existing conditions runs out. Bugger, back to the NHS. Work is busy, lots to do, systems which make it difficult to do much of anything. Not really news. Mum has been in for 2 scans to try to work out what is causing the pain in her chest (that isn’t a breast any more). She has a follow-up appointment with her surgeon in 2 weeks. 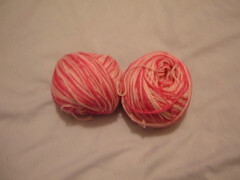 I’m mostly focussed on the knitting again. We have a little extra money this month, because of the way A gets paid every four weeks but our bills are all monthly, so we’re allowing ourselves a bit of spending money. 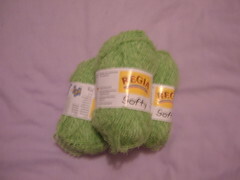 I splashed out at Get Knitted online again yesterday, feeling kind of guilty about it but I’m sure I’ll get over that! This time I bought a lucky dip pack of 4 different tofutsies sock yarns, a set of Knitpicks options interchangable needles anda selection of their fixed circular needles in sock sizes. I absolutely love the ones I bought last weekend. 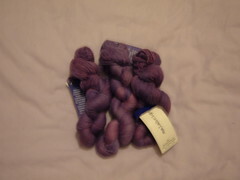 and which will eventually be bedsocks. 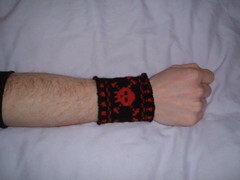 I also completed a skull wristband for A, and he’s really pleased with it. 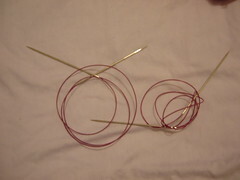 The socks I’m working on are on two circular needles, which is a new technique. 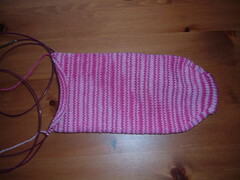 It’s going well so far, but now I have to do the heel on the first one and I’m not sure I understand the instructions. I’ve got a couple of hours now to concentrate on it so I’m sure I’ll work it out. The scarf could take a while, as I find so much repitition pretty boring, so I’m only working about 2 repeats per day to give me time to do other things as well. It’s looking good though. I think that’s pretty much everything…I’m off to play with socks. 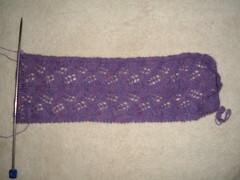 This entry was posted on January 31, 2009 at 12:15 pm and is filed under Health, knitting, Mum. You can follow any responses to this entry through the RSS 2.0 feed. You can leave a response, or trackback from your own site.